Catholic resurgence under James II. The long held fears that James II would reintroduce Catholicism came to fruition in Scotland with many deliberate, overt and contentious acts in 1685-8 – almost as if testing the waters before trying anything so blatant in England. It was a fact that there was a strong nucleus of Roman Catholic supporters especially among the northern nobles – Huntly and Erroll. There were also the converted placemen in positions of power and influence – the Drummonds (John Earl and later Duke of Melfort, and his brother James, Duke of Perth was the Chancellor. Both changed their religion in pursuit of their own ambitions. In practice the actions taken to favour Catholics served only to raise the people`s suspicions and generated open rioting. Much effort was put into pursuing conventicles and imprisoning, fining and executing those involved. 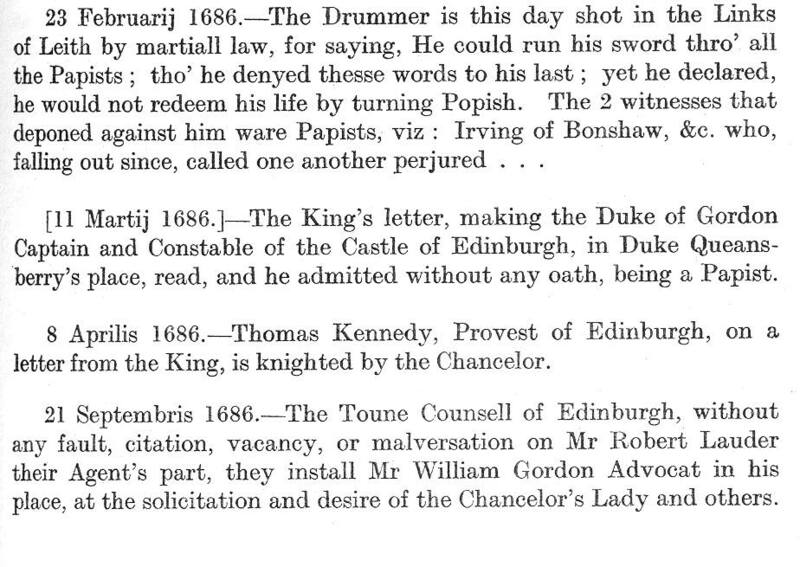 This was very evident in the instance of a Mr Glen, stationer of Edinburgh and several other Burgesses who were cited by the magistrates in October 1684 for not frequenting the kirk. But the Lady Traquaire and other papists were dismissed, and their citations declared to have been a mistake (Fountainhall Notices 14,15 Oct 1684). In contrast the action against non conformists of all types was ramped up with sittings of the Justiciary Courts in January 1685 and census taking of residents in Edinburgh from which suspects were culled. The Courts required ministers to provide lists of `irregular `people in their parishes and also those who had not taken Communion. The magistrates were compelled to accept a cess and required to administer the Abjuration Oath to their burgesses and all persons over 16 years of age. he came before the Privy Council again in January 1686. This time the Chancellor, via the Privy Council, made an order to prevent publication or sell any books that reflected on Popery – such as the Funerall of the Masse by de Rodon, and Tillotson`s Discourse against Transubstantiation. A copy of the order was given to every bookseller. When given to James Glen he advised the Macer that he had one book in his shop which condemned Popery very directly, and he wished to know if he might sell it, meaning the Bible. The order ran that a licence was required from the Chancellor or the privy Council and was a deliberate act of censorship intending to prevent controversy over the king`s religion. The discrimination appeared again in the Privy Council of 9 August 1687 when booksellers were required to state on oath the books they had received from England, printed and sold. This was at the behest of the Chancellor; several were imprisoned and all required to obtain a special licence. 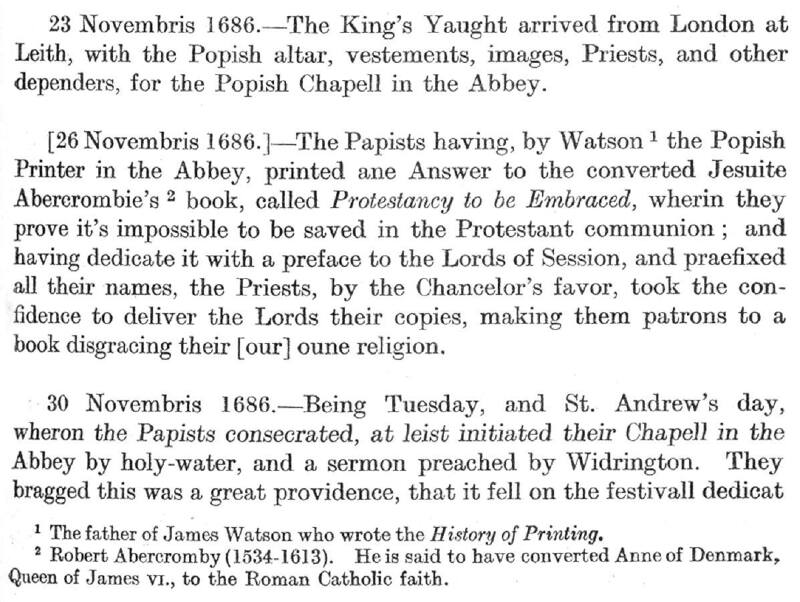 But James Watson the Popish printer in the Abbey of Holyrood was excepted from the Act, and allowed to print and sell what they pleased against the Protestants. In February 1688 Alexander Ogstoun, a bookseller, was pursued for selling Ussher`s Sermons against the Papistes and The History of the French Persecutions, all copies seized. 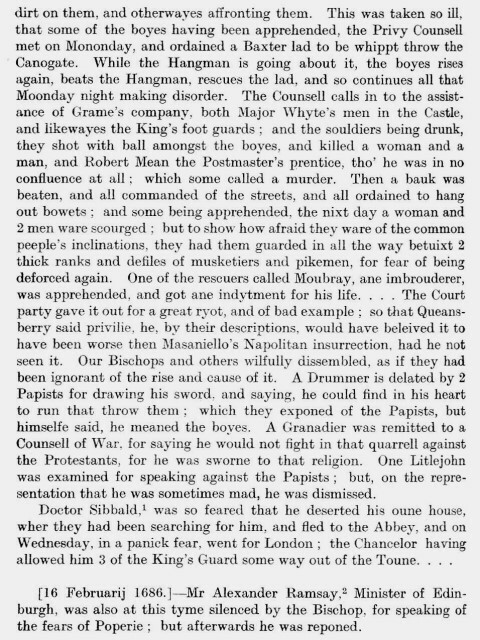 Further positive discrimination is evidenced by a 30 year old civil complaint that had been put aside because the complainant , Sir John Byres of Coats, was a Catholic. In December 1686 he reissued his libel and the Chancellor remitted the civil matter to a select Committee for consideration. The matter was settled in February 1687 by the Town of Edinburgh paying him £400 sterling for encroaching on his land. On the converse a modest `resistance` was shown by the ministers declining or forgetting to read a proclamation against seditious sermons alleging it was unclear. Meanwhile they suspected the apprentices and others were intent on a procession bearing effigies of the Devil and the Pope in his arms. Resentment boiled over on the night of 17 February 1687 when a fire occurred at Holryrood Abbey which destroyed a number of Popish pamphlets stored there, and threatened to burn down the Chapel so carefully restored for use of Catholic supporters. The kings response was a letter of 4 March 1687 giving pensions of £50 sterling to each of the four priests who served at the Chapel, while a Father Dunbar replaced Mr John Robertson, minister, as the King`s Almoner. A very pointed snub. The spread of resentment appeared in a novel encounter between a merchant accused of finding means to get round a price that had been fixed for English silks. When commented by the Chancellor “Could he be a good Christian that acted so ?, the merchant foolishly answered “And a good Catholick too”. A Macer was ordered to take the merchant to prison but he escaped into the crowd. A more blatant restitution of Catholicism was in the February of 1688 when a series of Masses and Litanies were said by the Abbey priests for the soul of Charles II who had died three years previosly – 6 February 1685. Shortly after the rules of the Popish College at the Abbey were printed which invited all children to have free education there, even though the formalities of an erection and patent under the Great Seal had not been given. Matters came to a head at the year end when on 9 December 1688 rioting broke out and the people marched on the Abbey intent on defacing and breaking up the recently restored Chapel as a mark of their objection to Popery. At the Abbey they were met by a group of about 50 soldiers under a Captain Wallace who resisted the mob with musket fire and throwing of hand grenades. At least one person died and many were wounded, but the mob quickly dispersed. That would have been the end of the matter but coincidentally some members of the Privy Council were meeting in the town at Blair`s House and they decided to intervene. This was duly done and the mob took out its spite on anything and everything Popish. They pillaged and broke down all the ornaments and the chapel furnishings, and followed this by rampaging through the Chancellor`s lodgings and the homes of known Catholics. It was estimated by the Duke of Gordon that the damage done was about 10,000 crowns and more. Gordon himself remained loyal and returned to the Castle where he was technically under siege , but even here he found his soldiers verging on revolt. Prompt action by the Catholic Officers and particularly his deputy Colonel Winram eased tensions. Most men renewed their oath of allegiance and those who would not were disbanded and turned out of the Castle. Having decided to hold out to the last, Gordon sent for support from his northern supporters, but the arrival of some 45 or so Gordon clansmen at Leith created a panic that the feared Highlanders were being brought in. Gordon ordered his clansmen to return north, rather than provoke a full scale confrontation. There followed several days of negotiations with the Council in which Gordon doggedly clung to his duty to King James (he was severely hampered by the lack of response from the King what he should do). James fled to the continent in January 1689 and left no orders for Gordon, who again wrote him. Meanwhile the Scottish throne had been offered to and accepted by William of Orange who had issued a general order that Catholics were to quit their charges and surrender their commissions to the next senior Protestant officer. In the Castle this was a Lieutenant John Auchmutie, but he was persuaded by Gordon to remain loyal to him, albeit it placed both of them at some risk from fractious persons both within and without of the Castle. Eventually a messenger brought news that Gordon should surrender the Castle to Colonel Winram and go to his estates in the north to await further orders. However, Gordon was not satisfied with the message brought by someone he did not know, and in the absence of anything in writing to confirm it, he decided on the prudent course – to retain control. There followed protracted wrangling for control of the Castle and proclamations requiring it to be handed over. An amusing incident at this time was Gordon`s droll comment to the Heralds who had come to the Castle Wall to make proclamations, that they should not proclaim traitors to the State whilst wearing the King`s coat on their backs ( the tabard with royal arms), or at least they might turn them round. A Convention of the Estates took control of the country and were minded to follow events taking place in England and invite William of Orange to take the throne. They began dismantling the catholic presence and called in the Cameronian Regiment to besiege the Castle. Meanwhile John Graham of Claverhouse, Viscount Dundee, arrived in Edinburgh and, having seen the way the wind was blowing, consulted with Gordon at the castle before moving on with his regiment to the north and fate at the battle of Killiecrankie. The Cameronians were then replaced by Colonel MacKays regiment in March who within the week left to pursue Claverhouse in the north. Around the Castle various `works ` , batteries, embattlements and trenches were created with occasional cannon fire into it. This brought only a modest response of fire from within, as they had very little ammunition and gunpowder. This was exacerbated in early April when all supplies, including food, were stopped and the north loch was drained in an attempt to deprive the Castle of water. Throughout May and June the bombardments continued with several soldiers killed and others wounded, but surprisingly little real damage to the walls themselves. In his discussions with Claverhouse Gordon had been advised to keep charge of the castle for 20 days and Claverhouse intimated that he would relieve him. After three months there was no sign of relief from any of the King`s supporters and supplies of food and ammunition were running out. After negotiations and breaking of an agreement by the besiegers, Gordon was finally obliged to surrender the Castle to Sir John Lanier on 12 June 1689. Gordon and several others, including Colonel Winram, were kept as prisoners of war until King William ordered their release; Gordon being discharged on his spoken word of honour. Cautious as ever, he followed up by putting in writing what he had promised wary that his intentions might be misunderstood. Gordon later visited the exiled Court at St Germain where he was coldly received and on returning to Scotland was closely watched, and often imprisoned. When George I came to the throne Gordon was considered hostile to the Hanoverian dynasty and was again confined to Edinburgh on his word of honour. He died in Leith on 7 December 1716.